This recipe came up on my Facebook newsfeed from ‘Looking through my kitchen window – Paleo / Primal’ and after sharing it on my wall and a friend making them tonight, I couldn’t wait to make them either! 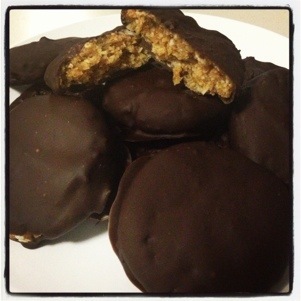 I used my thermomix and it literally took me no time at all to make them. Place walnuts into TM bowl and chop on speed 9 for 10 seconds. Next add your dates and chop on speed 9 for a further 10 seconds. Add the remaining ingredients and chop for 8 seconds on speed 6. Roll into balls, flatten and place on a lined baking tray in the freezer for around 10 minutes. Dip the biscuits in melted chocolate and place back in the freezer for another 10 minutes or until set. ← Wasabi Peas – innocent snack, I think not! these are delicious em!! made them last night, using vanilla extract instead of peppermint, as we didn’t have any… SO good! That’s great Kaz! Good idea, I am also going to try orange oil next time as my favourite flavour is Jaffa!